Randy Tankersley is a self confessed history nut. He is also a complex, creative man with a gift for storytelling. His storytelling takes many forms. He used storytelling while working as a broadcast photojournalist for ABC News Midwest bureau—a job that brought him to St Louis in 1988. 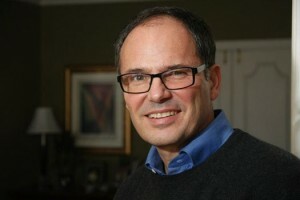 He excels at “visually branded storytelling through social media,” for Tankersley Productions, Inc., his own video production company specializes in corporate communications and commercial and industrial marketing. And he brings his love of history and storytelling together in STL Lost and Found, an entertaining audio walking tour guide of St. Louis that he created for locals and tourist alike. Hand held and easy to use, STL Lost & Found divulges the fascinating facts and backgrounds of St. Louis’s top attractions. 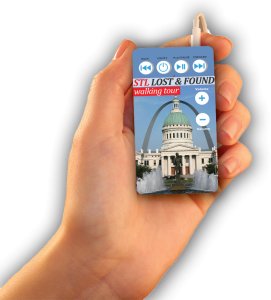 One can buy STL Lost & Found at many retail outlets throughout the city and from iTunes. Check HERE for more information. St. Louis is a treasure trove of historical tidbits and interesting facts. The St. Louis Lost and Found walking tour explores many of these interesting tidbits as guests explore the Gateway Mall area in downtown St. Louis. I’ve included some of that information here below and other things I just didn’t have room enough to include on the actual tour. 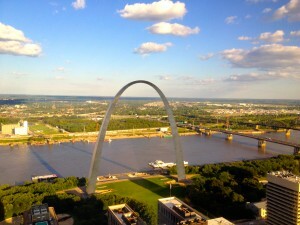 So I hope you enjoy your abbreviated tour of interesting facts about St Louis. Edison’s lightbulb, Henry Ford’s model T and Louis Sullivan’s Wainwright Building all have something in common? They are all firsts! In each of these cases others had made significant progress in their discoveries, yet it was these men that achieved what actually and practically worked. Edison didn’t invent the first light bulb, he invented the first practical light bulb that worked. Henry Ford didn’t invent the automobile, nor was he the first to use an assembly line. He was the first to put these two things together and the result was a revolutionized American industry. Louis Sullivan didn’t design the first tall building. He designed the first modern skyscraper to which all other skyscrapers would be modeled. You can find Edison’s light bulb and Ford’s first Model T at the Smithsonian in Washington D.C.. 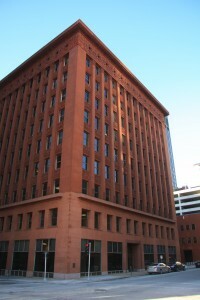 But the only place you can see Louis Sullivan’s Wainwright Building is in downtown St. Louis at Seventh and Chestnut Streets. Although it seems quite simple today to look at a building and know what a tall building should look like, just remember, that was not always the case. There always had to be a first and St. Louis has it. Here’s an arguably St. Louis first. 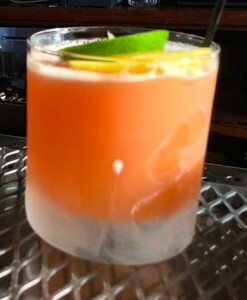 A fruity mellow rum cocktail called planter’s punch. Although today you may not be aware of this drink, it was popularized in the United States over a century ago. Like many cocktails of late it seems to be making a resurgence. So why does St. Louis claim this particular cocktail, you may ask? It so happens that on the corner of Fourth and Chestnut a grand hotel called the Planter’s House Hotel once stood. During the 1800s anyone who was anyone stayed there. Such notables included Abraham Lincoln, Charles Dickens and Buffalo Bill. Inside the hotel was a popular watering hole where everyone met for drinks. Behind the bar stood a heavy set gentleman with a jolly disposition and a handle bar mustache who greeted each fellow with, “Hey gent, what’ll ya have?” His name was Jerry Thomas, the bartender at the Planter’s House Hotel. He wrote the book on serving cocktails, really! He wrote the first book ever on mixing drinks, The Bon-Vivant’s Companion. This is the same guide many bartender’s use today. After tending bar at the Planter’s House for a few years, Thomas left St. Louis and tended bar in many of the major cities of the U.S. before returning to his native New York. Because of his outgoing personality, Mr. Thomas became extremely famous and his drinks were unmatched. Captains of Industry and celebrities alike referred to Mr. Thomas as “The Professor.” Although there is no direct evidence other than the 1933 edition of Bon Vivant’s Companion stating that planter’s punch was created here in St. Louis, it only stands to reason because it bears the name of the hotel of which he was employed. Although others lay claim to the drink, a plaque commemorating Mr. Thomas and his drink has been placed on a granite slab outside the Bank of America building where the hotel once stood. The Planter’s House Bar located at 1000 Mississippi Avenue bears the same name of this historic hotel and serves many of the cocktails in Mr. Thomas’ book, including of course, you guessed it, planter’s punch. A soon to be revived St. Louis favorite, or so they hope, me too. Downtown St. Louis is currently undergoing major change with the construction of the CityArchRiver project. Included in the project are plans to demolish the Arch parking garage and relocate parking to other garages in the downtown area. Among those garages is the Stadium East Garage. That in and of itself is not interesting. What is interesting however is that beneath the Stadium East Garage is the burial site of Chief Pontiac. While most American’s are not familiar with the Chief, they may remember that an automobile was named after him and they would be right. 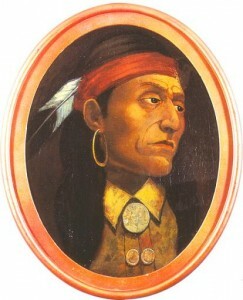 Chief Pontiac was an eighteenth century Osama Bin Laden. Pontiac was responsible for organizing Indian tribes from the Great Lakes to the lower Mississippi Valley. With the help of the French, these tribes were organized to fight the British army and push back British incursion into Indian lands. United, he was convinced tribal nations could limit further British expansion. That same territory would one day become the western United States and unfortunately for him, he failed. Not only did he fail, but shortly after signing a peace agreement with the British, a member of the Peoria tribe murdered him in Cahokia, IL. Pontiac was then buried in disgrace where the East Stadium Garage now stands. So… when visitor’s park their car in the East Stadium Garage, they are parking on top of Pontiac’s grave, a disgraced Indian Chief who dedicated his life to limiting western expansion into tribal lands. Individuals parking there are there to commemorate that westward expansion, adding insult to injury to Chief Pontiac who fought against that very thing… and so it goes. Being “green” is nothing new to St. Louis. It all began in the mid 1800’s with an implement merchant by the name of Henry Shaw. Shaw made his fortune in St Louis as a young entrepreneur selling hardware to early pioneers who set out from St Louis to conquer the West. Having made his fortune, it was his desire to give back to the people of St Louis by creating an unrivaled world class Botanical Garden. Located at 4344 Shaw Boulevard, “The Garden”, as it is affectionately referred to by most St. Louisans is officially known as The Missouri Botanical Garden and is ranked by the Travel Channel as the best Botanical Garden in America. It features 34 unique gardens, the least of which include the English Woodland, Japanese and Victorian Gardens. The influence of the Garden can be seen throughout St. Louis in its home and institutional landscapes. No better example of this is the popular City Garden at Eighth and Market in downtown St. Louis. The Missouri Botanical Garden assisted in designing, creating and implementing this urban oasis. It is a joy to the senses alive with native flowers, refreshing fountains and creative outdoor works of art. Mr. Shaw may not have understood today’s idea of what being “green” is, but he certainly was among the first in St. Louis to understand the importance of a “green” community. He felt urban dwellers needed a refuge from the City and an escape to Mother Nature. Locals and tourist alike can sample a little of that here at the City Garden just a few blocks west of the Gateway Arch. You won’t be disappointed. Ask most people and they will tell you that you will find the Liberty Bell in Philadelphia and that is true. But were you aware that you could also find it in St. Louis? You can! But not for much longer. Eero Sarrinen, the designer of the Gateway Arch, hid the Liberty Bell in his original design. Although most St. Louisans are unaware, you can still find it there today. The Arch ground renovations however are now underway and will permanently alter that design. So you will need to hurry if you would like to take one last look before it’s gone. What you’ll need to do is go down and take the tram to the top. Once there, find an open window facing the City. Look directly down and you will see sidewalks leading to the present day entrance’s on both the North and South legs. Did you notice the shape of the sidewalks outline the shape of a bell? Eero said that bell outline represented the Liberty Bell. Still, don’t see it? Look to the crest of the hill closest to the City. At that crest the sidewalk suddenly ends for no apparent reason. From the ground it looks like a mistake, but from the top of the Arch you can see that it is the yoke of the bell. Have fun. Take a look for yourself. But hurry, it won’t be there much longer. After it disappears you will have to rely on imagination.